Search engines remain one of the best sources of online traffic. A high-ranking page can bring in thousands of visitors to any web presence. For that reason, pretty much every website owner is (ideally) concerned with SEO. We have talked about this topic in the past, for example how to do proper on-page SEO, technical SEO or keyword research. However, just using WordPress is already putting you ahead in the SEO game. In fact, some would argue that WordPress is the best CMS for SEO and there is merit to this view. In this article, we will have a look at what makes the platform (possibly) the best for search engine optimization. Is WordPress the Best CMS for SEO? Well, is it? Let’s see. Just using WordPress as it is gives you several advantages in the SEO game. Especially in regards to on-page SEO, the platform allows you take care of a lot of important elements. Proper HTML markup — Though written mostly in PHP, WordPress creates HTML pages that are easily understandable by search engines. The latest generation of themes (like Genesis) have even started to take advantage of HTML5 and the improvements it brings. SEO-friendly permalinks — WordPress comes with the ability to use so-called “pretty permalinks.” That means links to posts and pages can contain keywords so search engines and visitors understand what they are about. Of course, you can control the content of the link which is the new standard setting in WordPress. Title tag and headings — The title of a page (which is usually wrapped in h1 tags) is one of the most important parts of on-page SEO. Together with other heading tags, it informs Google about the information in your content and gives it structure. WordPress allows you to set all of this up without manually writing the necessary HTML tags. Easy content creation — Content has become the tool to stand apart in search engines. Thankfully, as a former blogging platform, WordPress makes creating high-quality content as easy as using a word processor. Multimedia content like videos and images are also no problem. Optimized images — Talking about images, besides adding photos and other visuals to your content, the WordPress editor also allows you to further optimize them with ALT tags, descriptions, and more. Pretty good right? And these are all standard features included in the core product. It does not take into account all the things you can add to it. WordPress comes with a lot of extra components that can further improve the search engine optimization of your site. One of them is themes. Thanks to them, you can use WordPress to build pretty much any website. Whatever your goal is — a business website, portfolio website, online shop — there is likely a theme for your particular goal, industry, or purpose. Themes help in many different ways. For one, a high-quality theme will make sure your site spits out the proper HTML markup we talked about earlier thus covering your technical SEO. However, good themes also make your site look professional and appealing. This influences things like whether visitors will stay on your site (or click the back button) and for how long. Both are signs of quality (or lack thereof) for Google that will influence your search rankings. So, it’s not just about looks. In addition to themes and WordPress standard features, there are also loads of WordPress plugins to further improve the SEO capabilities of the platform. Yoast SEO and All-in-One SEO Pack are two plugins that we talk about very often, however, there are plenty more. These plugins improve certain parts of the WordPress SEO puzzle to make the platform even more effective. For example, the aforementioned Yoast SEO provides you with a detailed breakdown how to improve the on-page SEO for every single piece of content and also includes SEO copywriting tips. Besides that, it also can take care of your robots.txt, XML sitemaps and a lot more. However, there are also SEO plugins to improve your images, integrate your site with external tools like Google Search Console and Google Analytics and much more. By now, it is well known that Google cares about how long websites take to load. Especially for mobile sites, more on that below, the time it takes for sites to appear on screen is an important indicator of quality. As anyone who has ever set up a WordPress website will attest, they tend to load rather quickly in their standard configuration. At the same time, it’s true that if used incorrectly, WordPress sites can get really slow. However, if you pick a high-quality theme, use good hosting, and follow best practices to speed up WordPress this really shouldn’t be an issue. Should you currently be dealing with a slow site, you can find help to remedy the situation in this case study. Since we were talking about themes earlier: By now all themes that want to be accepted into the WordPress directory need to be mobile optimized. For good reason. In a world where mobile devices eclipse desktop computers everywhere and where Google is very vocal about using mobile friendliness as ranking criteria, no website should be without. In fact, without mobile optimization websites do not even show up in the Google results for mobile search requests anymore. However, even if don’t have a fitting theme (yet), you can use plugins to create a mobile version of your site such as Jetpack. One of the best ways to bleed search rankings is for your site to be suspected of spamming, infecting others with viruses or being harmful in some other way. You might think to yourself “Well, I’m not going to do that, so this doesn’t apply to me”. Unfortunately, that’s not always up to you. Your site can still land itself on spam lists if it gets hacked. A lot of shady individuals out there are just looking to compromise your website and use it for their own purposes. If that happens, you might find yourself on the receiving end of a Google penalty. Thankfully, WordPress is itself is very secure and its safety constantly monitored and improved. The WordPress security team does its darndest to stay on top of things and, should a vulnerability be detected, will send out a security update immediately (which WordPress will apply automatically). In addition to that, you also have plenty of security plugins to choose from. Plus, if worst comes to worst we also have an article that teaches you how to get back on your feet should your site ever get hacked. As much as we love to rank high in search engines, organic traffic is not everything and Google is not the only source of visitors. There are plenty of alternative search engines including social media platforms with millions of users. For that reason, it’s a good idea to integrate social sharing on your site from the beginning. WordPress offers plenty of solutions for this like Jetpack sharing, SumoMe, and more. How does that help your SEO? Well, search engines take social signals into account when ranking your site. That means the more people share your content on Facebook, Twitter, and other platforms, the higher it will appear in Google as well. Two birds, one stone. All the stuff above is good, however, if you need the skills of a seasoned developer to put it all into practice, it won’t do much good. Thankfully, quite the opposite is the case. WordPress is so user-friendly, pretty much anyone can implement what we mentioned on this list so far. We already talked about the simplicity of the WordPress editor, however, it extends to the rest of WordPress as well. Most things that are important for SEO (and everything else) can be configured with a few mouse clicks and need absolutely no coding knowledge. Another thing about the platform is that as a WordPress user, you will never be alone. If you run into problems, there are loads of people in the support forums willing to help out. Because of the popularity of WordPress that is a huge group of people to draw resources and knowledge from. In addition to that, the web is full of websites and articles such as this one that can teach you all you need to know about SEO. Along with Torque, you might also want to check Yoast, Elegant Themes, WP Beginner and others for further information. 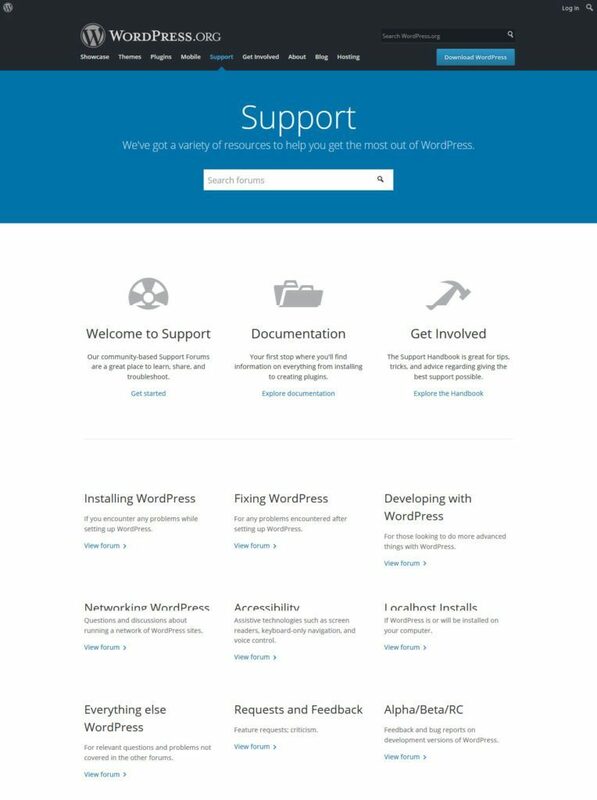 Finally, with the wide usage of WordPress, you can also find developers and other specialists to help you out in case you get stuck by yourself. With search engines continuing to be the most important source of traffic for most websites, SEO stays an important discipline and topic. For that reason, if you want to rank high in the search results, your best bet is to base your site on a platform that can help you do so. WordPress has done a lot over the years to be search engine friendly. By now, it is a mature platform with extensive SEO capabilities. WordPress plays nice with Google and other search engines, has loads of themes and plugins for advanced SEO optimization, is fast and mobile friendly, community supported, secure and easy to learn. In short, WordPress is the perfect CMS for SEO and building websites that rank well. If your goal is to hit Google’s front page, the WordPress platform is your best bet. Do you know any other reason why WordPress is great for SEO? Do you disagree with the above? Let us know in the comments section below!